'Questionable'? Yeah, right -- Zac Stacy had plenty of yards left in him after suffering a hip injury early against the Saints. 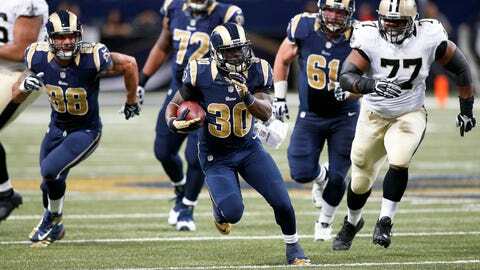 ST. LOUIS (AP) Zac Stacy has a good chance at reaching 1,000 yards rushing after a big game against the New Orleans Saints. The Saints probably thought they’d seen the last of the St. Louis Rams’ rookie running back early in the first quarter after he was helped off the field by two trainers and listed as questionable for the rest of the game with a hip injury. Instead, the Saints had to chase down Stacy for the rest of the game. He had 133 yards with career highs of 28 carries and a 40-yard touchdown run. “Questionable? Nah, I was never questionable,” Stacy said. Stacy and defensive end Robert Quinn, who had two sacks, two forced fumbles, a fumble recovery and two hits, gave the Rams (6-8) stars on both sides of the ball in the 27-16 victory that was not nearly as close as the score indicated. Coach Jeff Fisher said Quinn, who leads the NFC with 15 sacks, should be a contender for NFL defensive player of the year. Stacy is a surprise star on offense and had a huge bounce-back game against the Saints, setting a franchise rookie record with 106 yards in the first half. He’s tied for ninth in the NFC with 854 yards, along with a 4.2-yard average and six TDs. The previous week, Stacy was held to 25 yards on 14 carries. “He never takes negative runs,” quarterback Kellen Clemens said. “If it’s there, he hits it. If it’s not there, he creates a hole. Steven Jackson posted his eighth straight 1,000-yard season last year before taking a free-agent deal with the Falcons. Stacy, a fifth-round pick and the 160th overall selection after setting the career rushing record at Vanderbilt, took over as a starter in Week 5 after Daryl Richardson was sidelined with a foot injury. The 5-foot-8, 216-pound Stacy and fellow rookie backup Bennie Cunningham, 5-10 and 217 pounds, are physical players in smaller packages — about 20 pounds lighter than Jackson. The Rams opened with four straight Stacy runs for 15 yards and Clemens completed a 9-yard pass to Austin Pettis. On the sixth play, Stacy stumbled to the ground on pass protection. While Stacy was attended to on the field, there was plenty of time for the Rams’ P.A. announcer to recognize former two-time Pro Bowl quarterback Marc Bulger. Stacy left for the locker room after consulting with doctors but was back on the sideline not long after the team announced he was questionable. He missed just one snap, Cory Harkey’s 31-yard catch and run for the game’s first score after T.J. McDonald got the first of the Rams’ two first-quarter interceptions of Brees. Stacy had a 29-yard run on the next possession, stiff-arming Malcolm Jenkins near the end of the run and giving the Rams extra yards when Jenkins shoved him out of bounds for an unnecessary roughness call. Stacy’s 40-yard run in the second quarter made it 24-3. Fisher wasn’t surprised Stacy was able to return from what he said was a hip contusion. Like most weeks since Stacy took over as the starter, he’ll probably miss practice while getting over soreness.